Iran’s Supreme Leader sets out conditions for European powers if they want Tehran to stay in the 2015 nuclear deal. Iran’s Supreme Leader, Ayatollah Ali Khamenei, on Wednesday set out a series of conditions for European powers if they want Tehran to stay in a nuclear deal after the U.S. exit, Reuters reported. The conditions include steps by European banks to safeguard trade with Tehran and guaranteeing Iranian oil sales. U.S. President Donald Trump pulled out from the 2015 nuclear deal earlier this month and announced that sanctions will be reimposed on the Islamic Republic. “European banks should safeguard trade with the Islamic Republic. We do not want to start a fight with these three countries (France, Germany and Britain) but we don’t trust them either,” Khamenei said Wednesday, according to Reuters. Khamenei also said European powers must promise they would not seek new negotiations on Iran’s ballistic missile program and regional Middle East activities. “Europe should fully guarantee Iran’s oil sales. In case Americans can damage our oil sales..., Europeans should make up for that and buy Iranian oil,” he said. 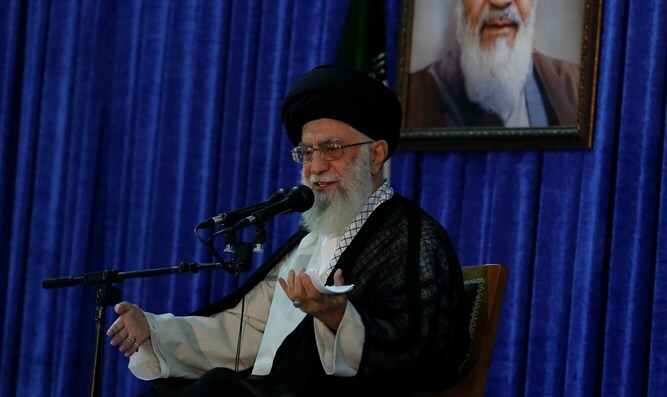 The Supreme Leader also accused the United States of violating UN Security Council Resolution 2231 that underpins the nuclear agreement with Iran, and asked Europe to secure “a resolution against the U.S. violation”. Finally, he warned that if the Europeans did not meet these demands, Iran would resume its enrichment of uranium, halted under the deal to minimize the risk of Tehran developing the means to build nuclear weapons. The EU's foreign policy chief, Federica Mogherini, last week indicated that EU countries are “talking about solutions to keep the deal alive,” while adding that measures would seek to allow Iran to keep exporting oil and for European banks to continue to operate. Iran’s ballistic missile program remains a concern not just for Trump but also for Europe and specifically France, which has in the past expressed concerns about Tehran’s missile program. Iran has routinely rejected any calls to curb its missile program.